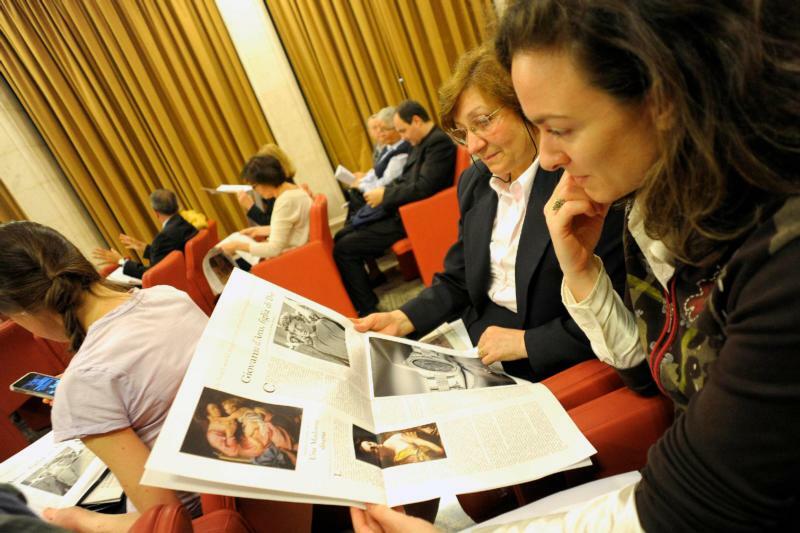 Women look at “Women-Church-World,” a monthly women’s magazine insert in the Vatican’s L’Osservatore Romano newspaper, in this file photo. Claiming a lack of support for open dialogue and for an editorial line run by women, the director and editorial staff of the magazine insert have resigned. (CNS photo/L’Osservatore Romano via Reuters) . VATICAN CITY (CNS) — Claiming a lack of support for open dialogue and for an editorial line run by women, the director and editorial staff of a Vatican women’s magazine have resigned. But the editor of L’Osservatore Romano, the Vatican newspaper, which publishes the magazine, countered that he has given the staff “the same total autonomy and freedom” that have marked its work since it began. “There is a return to the clerical self-referentiality and an abandonment of that ‘parrhesia’ (courage) so often asked for by Pope Francis,” said Lucetta Scaraffia, founder and director of “Women-Church-World,” a monthly supplement to L’Osservatore Romano. In December, Pope Francis appointed Andrea Monda, an Italian journalist and religion teacher, to be editor of L’Osservatore Romano. The new management at the newspaper has not shown support for the magazine’s mission and has tried to “weaken” it by launching initiatives that “seem competitive, with the result of pitting women against each other, instead of encouraging open discussion,” Scaraffia wrote in an editorial that was to be published in the supplement’s April 1 issue. Scaraffia sent Catholic News Service a copy of the editorial March 26 and a copy of an open letter to Pope Francis, explaining their resignation. Monda’s choice of new writers for L’Osservatore Romano and his suggestion of new writers for the supplement, Scaraffia said, suggests she and the editorial board are no longer seen as trustworthy and has closed the door to any chance of “true, free and courageous dialogue among women who love the church in freedom and with men taking part,” she said in the editorial. Responding in a note published by the Vatican press office, Monda said he never tried to weaken the magazine, underlining how its budget had been fully approved and translations guaranteed despite the need to cut costs within the curia. “My commitment was and remains strengthening the daily edition of the Osservatore Romano, certainly not in terms of competition but of complementarity with the supplement,” he wrote. “In no way have I selected anyone, man or woman, according to the criterion of obedience. If anything, on the contrary, avoiding any interference with the monthly supplement, I pushed for the daily newspaper to create discussion that was truly free, not built on a dynamic of one side against another” or closed cliques, he wrote. The publication began as a monthly insert in the Vatican newspaper seven years ago to give attention to women’s voices. When it was relaunched in 2016 as a magazine, Cardinal Pietro Parolin, Vatican secretary of state, said, “If we do not listen attentively to the voice of women in the great decisive moments in the life of the church, we would lose” the crucial contribution of the feminine genius in the church. The publication, which had the support and encouragement of Popes Benedict XVI and Francis, she said, was founded to be autonomous and run by women. Because of their openness to exploring the world of women in the church and of other faiths, Scaraffia said they were able to cover and explore many new subjects and experiences, including the abuse of women religious.